I receive countless emails asking about my travel regimen so I thought I’d share some of my absolute favorite travel products with you today, on the heels of my venture west to warmer weather. Sadly, the sun has yet to make an appearance but here’s to wishful thinking (and warmer temps, thank God). So, considering that it is travel season, these items should come in handy like, today. – I use it for my lips, cuticles, eyes AND sinus’. It works wonders to keep the entire lot hydrated. It’s also most effective for all climates. Coming from a blizzard (NYC) to a dessert (LA), climate was bound to give my skin something to get all chapped up about. 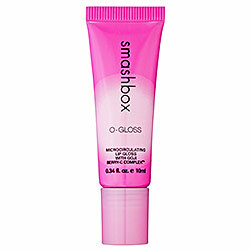 Smashbox O-Gloss – Flying leaves me ghostly pale and drained of all color — skin, eyelids and lips. O-Gloss comes in handy when I want a hint of pink — like a stain — with a surge of moisture. I also use it on my cheeks to give them a natural flush. – Yes, I still care about the state of my hair 30,000 feet above ground. The beach spray is the perfect formula to take travel hair and make it beach-chic. Messy tresses that look — and smell — salon styled. Klorane Dry Shampoo – The travel size is perfect to spray pre-landing for a quick touch-up-and-go. Gets rid of dirt and grease buildup from the flight and gives hair an added bounce of volume. 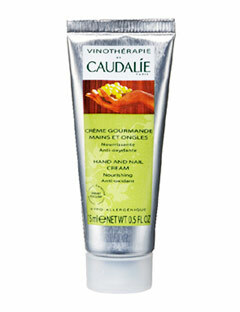 Caudalie Hand and Nail Cream – It’s imperative to hydrate hands and nails while in flight. My current cream of choice comes thanks to french skincare line, Caudelie. 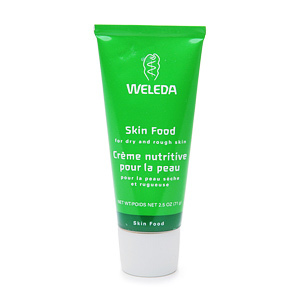 Full of anti-oxidants and grape seed, the cream smells amazing and moisturizes equally as impressively. I apply at least every 30 minutes. – You can use this balm anywhere, I like to pat it on my face, especially during a flight. With all of that reprocessed air, my skin is begging for some TLC. Skin Foods offers my face moisture, soothing properties of lavender and calendula and an all-around healthy glow. Can also be used on hands, feet, around the eye area, neck and elbows. Apply sparingly.